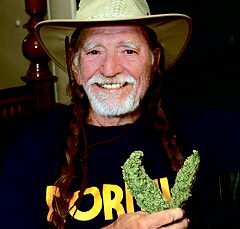 When Willie Nelson is on the road again, he will be traveling without a Texas drug charge hanging over his head. 1200 WOAI news reports a west Texas prosecutor said today he has entered into a plea agreement to allow the legendary singer and songwriter, and well known marijuana fan, to plead no contest to a charge of possession of drug paraphernalia, a misdemeanor, and pay a $500 fine plus court costs. "I have given him the option to do it by mail," C.R Bramblett, the County Attorney in Hudspeth County in remote west Texas, where Nelson was charged with marijuana possession when a Border Patrol officer smelled pot inside his tour bus when it was pulled over at a checkpoint on Interstate 10 last November, told 1200 WOAI news from his office in Sierra Blanca. Bramblett says he has spoken with Nelson's attorney, and the singer has agreed to the plea deal, and he expects the case to be settled within two weeks. "It will be a $500 fine plus court costs of about $278," Bramblett said. "All he has to do is sign the papers, and get me a cashier's check for the money." Bramblett said the case will be dismissed entirely if Nelson stays out of trouble for thirty days. He says officials have determined that there was a 'little bit less than two ounces' of marijuana inside the bus, which allows the case to be treated as a misdemeanor. Officials had first reported that as much as five ounces of pot was discovered, which would make the case a felony. "He got the same thing I'd give to anybody," Bramblett said. "If you'd have gone through and you woulda had a pipe and the same amount of marijuana, you'd have gotten the same thing."